Les trois Vallées France is the biggest and most challenging ski area of all. With over 600 kilometres of well connected slopes you can get lost easily so bring a map. The majority of slopes are located at high altitude and therefore, very snow-secure. The best mountain restaurants can be found on the Courchevel side, this also goes for the vibrant night-life but Val Thorens is certainly second best when it comes to bars and clubbing. 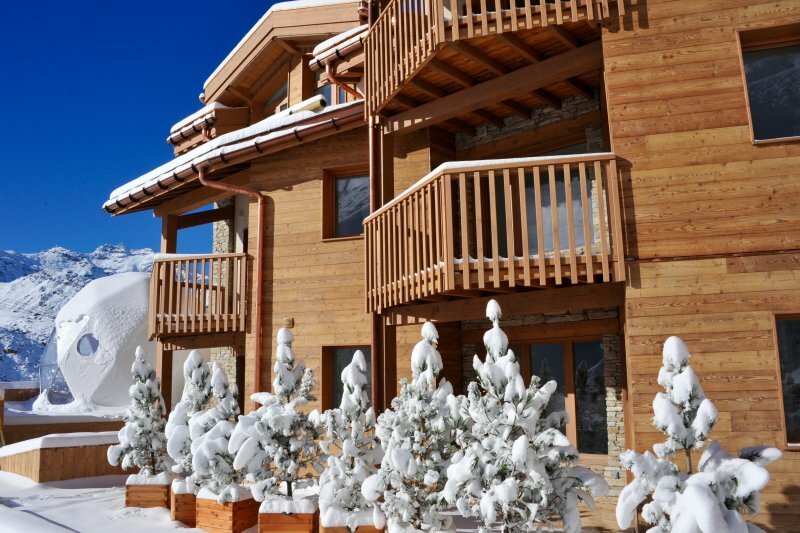 A cool and modern hotel, right in the middle of the famous resort of Val Thorens. Expect modern luxury with a chic Alpine touch to it! Let's say this is a village within a village. Hotel le Val Thorens offers everything under one roof and the design is a perfect blend between Alpine chic and authentic Alpine cosiness. High design, high quality, high altitude and top class luxury all under one roof. The hotel perfectly blends in with the new vibe that Val Thorens is calling out. Tailor made luxury, spacious rooms designed with luscious fabrics, modern day technology and comfortable furniture.